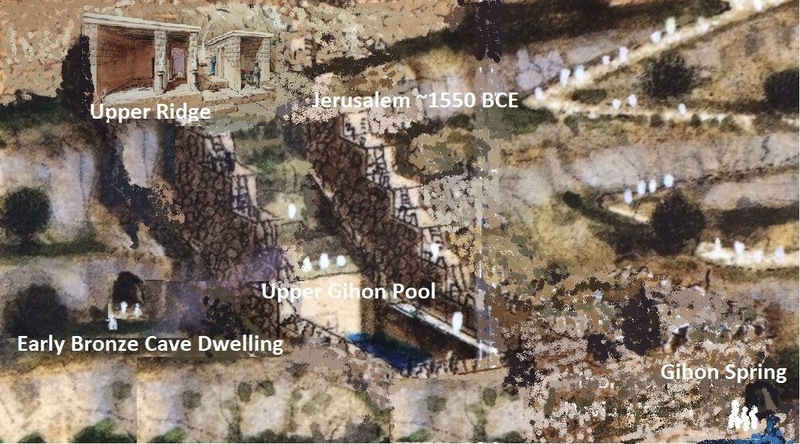 One of my all time favorite pursuits is the discovery of archaeology that I expect will scientifically validate the high ridge above the Gihon Spring in Jerusalem as the location of the earliest Biblical Beit El, which was Luz, also referred to in Kabbalah as Be'er Sheva. Before we get into the proof you should familiarize yourself with the diagram bellow. It illustrates four primary chambers which were carved into bedrock (the walls are remaining bedrock with spaces hollowed out). The complex on the Upper Ridge of the Gihon Spring served worshipers on or around the ridge ~4000-3000 years ago. The importance of scientific proof presents a departure from conventional wisdom, which may trigger a re-think by Torah scholars because scientific proof that this is Beit El would challenge everything scholars expect about the location of the 3rd temple. In addition it would cause a re-study as to why the first and second temples were built at locations associated with their ultimate destruction. There are many unique features of this complex, arguably the most striking (for now) is the discovery of a flimsy (~3cm thick slab) matzevah, monument or headstone (but not a grave marker) constructed on the bedrock in a square frame of rocks. Somehow this vital artifact survived thousands of years whilst everything else around in the City of David, where it is located, was burned and destroyed down to the bedrock leaving only small clay artifacts as tell tale clues. (See 2nd chamber from the south - left). Further, how this stone remains physically erect or connected to the bedrock remains a mystery that archaeologists have not yet determined. Its worth noting (at least to my knowledge) that a similar standing matzevah built into bedrock in a frame has never been discovered at any other archaeological dig in Israel. Why this artifact survived may be crucial to the theory of this complex. I've written numerous articles on the subject some of which can be discovered here or in the more detailed thesis of Jerusalem's Origin. In essence, the location and complex are sacred and the most likely inspiration for its construction, but its connection to the Bible and to the origin of the nation Israel is crucial and in my opinion its about to be proven by archaeological science. 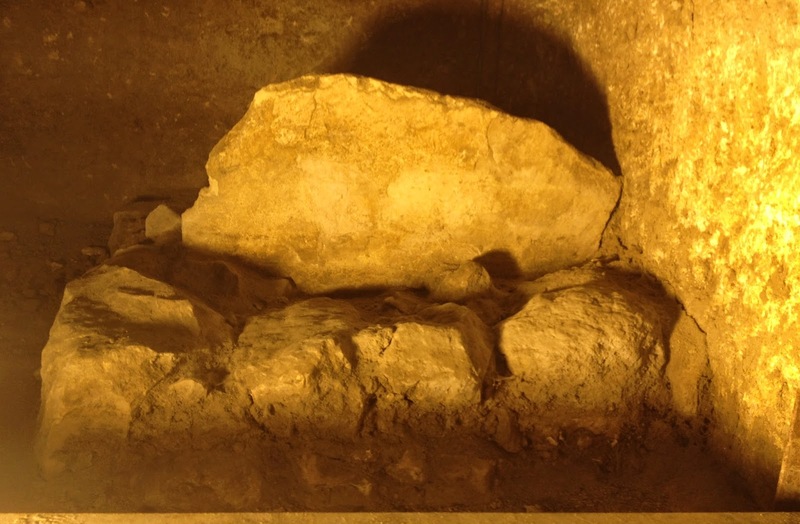 In the Biblical narrative, Jacob took 12 stones from this altar and placed them around him during the night. The stones converged to become one, and that one stone became the matzevah, which I believe is located in the chamber illustrated above. In accordance with Jewish literature the matzevah should be adjacent to the mizbeach (altar) on which Isaac was offered as a sacrifice to God by his father Abraham (see the chamber to the right for possible identification). According to all opinions the altar of Isaac is the location by which the Holy of Holy's must be designated around which the Temple is built. Kabbalah describes the south east corner of the altar on land belonging to the tribe of Yehuda as it points into and penetrates the land of the tribe of Binyamin on which most of the temple is built. 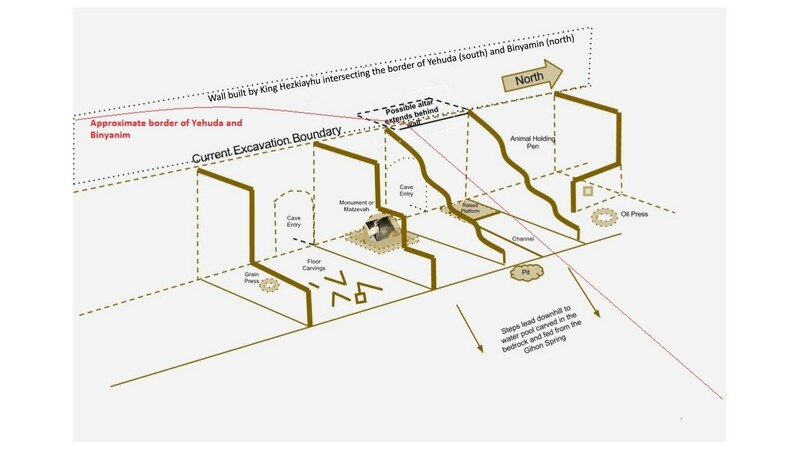 In the illustration above you can see that the wall, constructed by King Hezekiah crosses, what may be the altar (table), on the line that divided the tribal land of Yehuda and Binyamin exposing the south east (front left) corner immediately in front of the wall. I believe Jacob and his son's built the first walls to fulfill Jacobs promise to build a house of God (Genesis 28:22) and to protect the sanctity of this sacred site. After they were exiled to Egypt, the site and the land was overwhelmed by the families of Egypts pharaoh whose direct lineage to Ham, Noah's son, included Kanaan his grandson. This occupation was in familial competition with the descendants of Noah's other son Shem (Malchitzedek) who originally used the site as a place for worship and who named it Shalem after which the city Jerusalem was named. During a period of several hundred years whilst Jacob's family in exile grew to become the nation of Israel in Egypt, this sacred site was constructed upon and buried adjacent to and under buildings including the water tower that covered the Gihon. 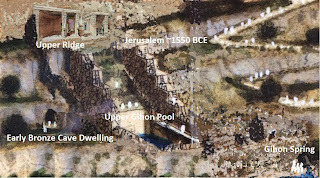 Of course none of this is a scientific proof, we will have to wait for that, but there are already important archaeological proofs that this site is connected with the King of Bethlehem, which is King David's birthplace. Its quite probable the site was redeveloped by King David during his reign to house the Holy of Holies that was captured in Shilo by the Philistines. Later King Hezekiah who blocked the waters of the Gihon and who constructed the foundations of a city wall that penetrated the ground at this site may have uncovered this previously buried complex. Its recent re-discovery revealed that soft earth had been packed to purposely preserve the entire site. Patiently I wait to discover more.